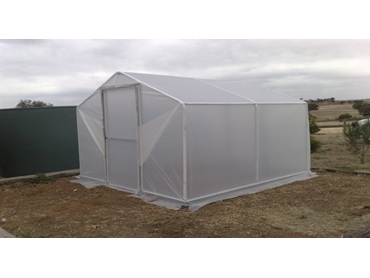 Domestic Greenhouses are available from David Gill Greenhouses . They come in kit form with price available upon application. They are ideal for the garden enthusiast who likes propagating all year round for their own garden or the keen vegetable grower who wants to have fresh crisp home grown vegetables. David Gill Greenhouses is an Australian family owned and run business. These domestic greenhouses emphasise craftsmanship and quality construction, rather than profits. This attribute ranks David Gill’s standards and reputation higher than most of the competition. David Gill Greenhouses uses materials sourced from around the world. A Dutch company, Ridder Drive Systems provides all mechanics related to automated ventilation systems. Meanwhile, French company, Agripolyane contributes quality greenhouse plastic, while Celloclim and Bogaerts Logistics provide automated and simplified harvesting machinery and tools.